Most of us are acquainted with the old riddle that goes: “If a tree falls in the forest, and no one is in the area to hear it, does it make a noise?” From a communication point of view, the answer must be a definite "No." Even though there are sound waves, there is no sound because no one perceives it. For communication to take place, there must be both a sender and a receiver. This guide is focused on the receiver - the one who provides feedback to the sender. Most people spend roughly 70% of their waking hours in some form of verbal communication. Yet, how many of us have ever had any formal training in the art of listening? This guide will teach you everything you need to know in order to be an effective listener. This places the responsibility for good communications squarely on the shoulders of both the sender and the receiver. Each of us plays the roles of sender and receiver many times each day. Thus, it is important to learn to play each role well. Researchers have found that the average individual spends considerably more time each day in listening than in speaking, writing, or reading. Therefore, listening is a very important communicative skill. Did you know that we devote about 40 to 45 percent of our working hours to listening? And did you know that, if you have not taken steps to improve this skill, you listen at only 25 percent efficiency? Putting these thoughts together, do you feel comfortable knowing that you earn 40 percent or more of your pay while listening at 25 percent efficiency? If not, perhaps acting on the information imparted in this chapter will improve your listening skills to above the average in listening efficiency. Tests have shown that we can significantly raise the level of our listening performance by a small amount of study and practice. Recognizing the value of effective listening, many companies offer training programs to improve this communicative skill. Some years ago the Methods Engineering Council compared one group of participants in a preliminary discussion on efficiency in listening with a second group not participating in such a discussion. The comparison was made by testing each group. The test results showed the marks made by the first group were 15 percent higher - a significant improvement. We hear - often without listening - when sound waves strike our eardrums. When we don't remember what we have heard, it is probably because we did not listen. A good example is the situation that frequently occurs when we are introduced to a new employee or a new acquaintance. A few minutes later we can't recall the person's name. Why? Because we probably failed to listen to the name when we were introduced. 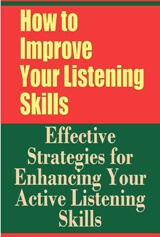 Johnson defines listening as "the ability to understand and respond effectively to oral communication." Thus, we can state at the outset that hearing is not listening. Listening requires more than hearing; it requires understanding the communication received. Davis states it this way: "Hearing is with the ears, but listening is with the mind'." He encourages others to listen to what he says because he appears more attentive and better mannered. The typical listener, after 2 weeks can remember only 25 percent of what he has heard in a briefing or a speech. Therefore, listening is not effective for receipt and retention of factual details. For retention of factual details we must place our dependence on the written word. Researchers have discovered that we can improve our listening comprehension about 25 percent. Most of us process the sender's words so fast that there is idle time for us to think about the message while it is being given. During this idle time a good listener ponders the sender's objectives, weighs the evidence being presented, and searches for ways to better understand the message. It follows that good listening can be considered "a conscious, positive act requiring willpower." The ability to listen more effectively may be acquired through discipline and practice. As a listener you should physically and mentally prepare yourself for the communication. You must be physically relaxed and mentally alert to receive and understand the message. Effective listening requires sustained concentration (regardless of the length of the message), attention to the main ideas presented, note-taking (if the conditions are appropriate), and no emotional blocks to the message by the listener. You cannot listen passively and expect to retain the message. If you want to be an effective listener, you must give the communicator of the message sufficient attention and make an effort to understand his viewpoint.